Last week I had an exam in my Computational Science course. In the course, we learn how to program some of the most complicated mathematical concepts into the computer and use these programs to solve problems in physics. It’s a very difficult course but my professor is incredibly helpful, so I have been enjoying it. We had to handwrite a lot of computer code in the exam. This was difficult because when you are writing code on the computer, you can check to make sure it works and does what it is supposed to. But when you are writing the code on a piece of paper with no way to confirm it, it is a little nerve racking. We got our exams back yesterday and I got an A, which made me very proud of myself since I usually get low B’s or high C’s in these upper level courses. 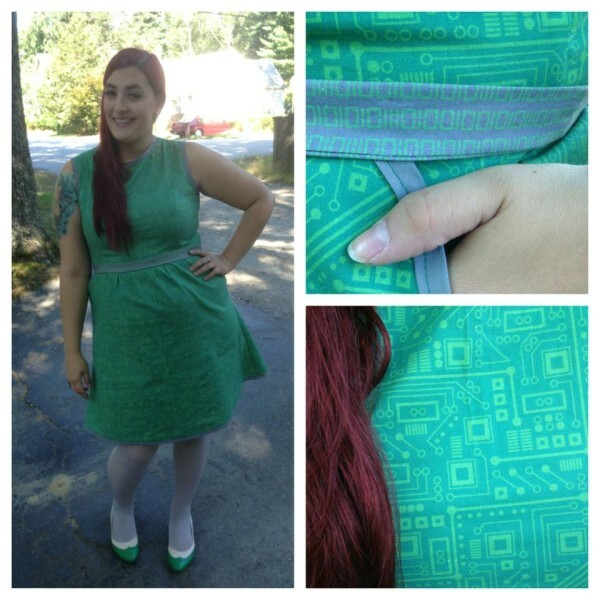 So naturally, I rewarded myself by caving in and ordering that circuit board dress from Modcloth. Thankfully it is different from the one I made since mine is green. I bought my fabric on Spoonflower and the print was designed by a rocket scientist who has some of the most amazing fabric designs! I really like the binary fabric from the same designer. I wanted to incorporate it into this dress since binary codes are used a lot in the field of computer science. I did make a collar with the binary fabric, but it turned out a little weird. I decided to make a belt instead; I really like the way it turned out. The dress goes really well with my green kitten heels from B.A.I.T. and grey tights! If you want to learn more about binary numbers and codes, James May has a fun video explaining why binary is important and what it is!